Do you get feet cramps while wearing your climbing shoes? Are you tired of wearing painfully tight shoes while being on the adventure? Would you like to have a pair of climbing shoes that don’t stink after just one climb? We have researched over fifty different pairs of shoes to come to this top 10 list. We have covered all shapes, purposes, and surfaces in our list so I’m sure you will be able to find at least one pair that meets all your needs, so let’s see. How to Wash Climbing Shoes? Climbing shoes should be washed by hand. 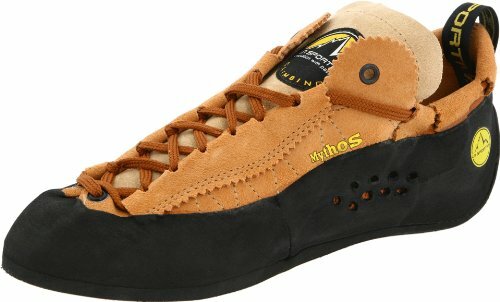 How Many Styles of Climbing Shoes Exist? There are flat climbing shoes, moderate climbing shoes and aggressive climbing shoes. Learn more about their differences here. The Mythos are one of the best selling shoes currently in the market, and in our opinion the best overall, despite the fact that these are one of the oldest climbing shoes that you could find. You might say that they are old-fashioned or outdated, but I think that the fact that they are still selling (best-selling) make them an all-time classic and says a lot about their quality. The material used for the upper part is natural leather that feels cozy the second you put them on. There is no break in period and getting used to them, they fit perfectly from the beginning. However, as the leather naturally stretches, the shoes will mold over the time into the shape of your feet which will make them even more comfortable. Mythos can easily be described as the most comfortable shoe on the market and that’s something any climber will tell you. The patented lacing system adds up to the comfort too because it allows you to customise the tightness of the shoe so that it will fit on your feet perfectly. Mythos are categorized as flat climbing shoes which make them perfect for the crack climbing, but they are really versatile so you can use them for much more than just that. What makes this shoe unique is the combination of the stiffness of the sole and the precise fit. 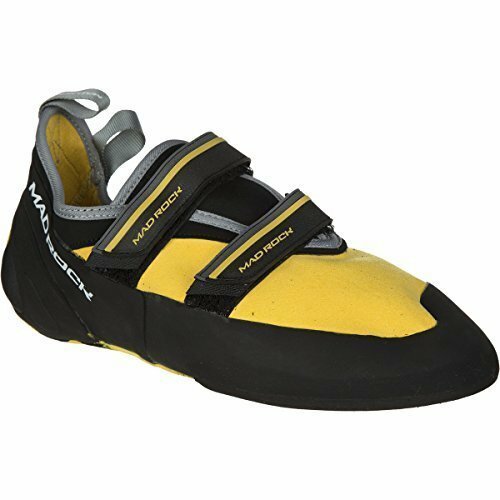 This is one all-around shoe, not as versatile as some other models, but it is perfect for big-wall climbing which is what it was designed for in the first place. Its design allows you to climb anything anywhere with the phenomenal edging, a flat toe and ankle protection. It also features a semi-stiff sole that is really supportive and keeps the foot strong without causing you toe cramps which make it a perfect all-day shoe. The stiffness of the sole allows smearing up to 5.12 which adds a lot to functionality and comfort. One of the greatest things is that TC Pro never “rolls” which means that sole of the shoe doesn’t deform under the pressure because it hugs your foot from all sides. The leather upper makes the shoe more comfortable and allows your feet to breathe. What we have here is one versatile climbing shoe, perfect for almost anything. It is really hard to beat the Muira when it comes to edging and crack climbing on granite and sandstone. It takes a long break-in time, at least one week to one month, which depends on how often you’re climbing. However, once they break-in they become very comfortable for the aggressive shoe, of course. 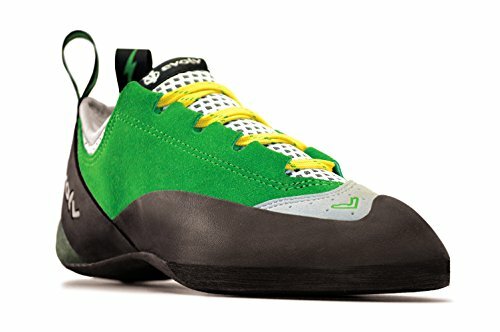 These are asymmetrical high-performance shoes with an amazing sole that provides comfort even for new climbers who aren’t really used to wearing this kind of shoes. There is a little extra space inside the shoe which allows you to wear a ticker sock if needed, but there is also a unique lacing system that allows you to tighten your shoe as much as you want to, but also provides a quick-on and off access with super comfortable thick laces. However, those laces tend to break easily, especially if you pull them hard and fast and tighten them too much. The unique balance between comfort and stiffness is what makes this shoe amazing. The design with the narrow toe shape makes it really precise, but combined with the Vibram XS Edge hard rubber that makes it really stable, this shoe gets the label of one of the best shoes in the market. 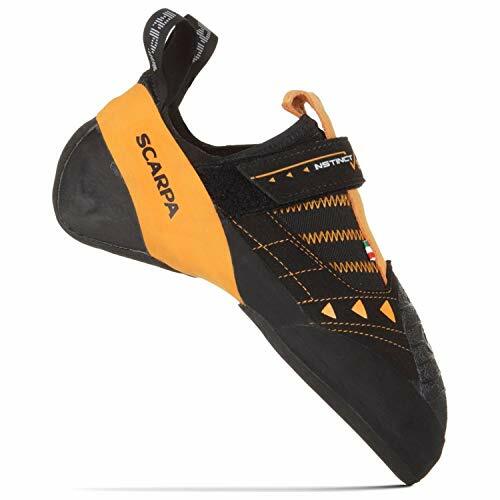 These are really highly rated shoes among climbers, especially because of the 5.3mm Mad Rock rubber formula the soles are constructed from, which makes them stiff but perfect for edging on tiny footholds. However, that isn’t the only great thing about them. Mad Rock Flash shoes are actually great all-around performance shoes thanks to the flexible polycarbonate midsole that offers a great balance between edging and smearing, which allows you to climb on all kinds of surfaces. The overall fit is just amazing, especially if you have narrow or mid-wide feet. Just make sure to get a half size down from your normal shoe size if you want them to be tight enough. The price is more than fair considering that you get a good-fitting, comfortable, great performing shoe that Mad Rock describes as a ‘workhorse of their line-up’. I think that says enough about this pair. Evolve Spark is a great all day shoe because it provides comfort for your feet during the whole day. Thanks to the 3-D Air Mesh in the heel and tongue you get a feeling of wearing a sock. Yes, it’s that soft and comfortable. I guess that designers thought mostly about the comfort when making this shoe because its whole design is focused on comfort. The semi-asymmetrical fit provides a little bit more room around the toes which allows you to wear a thick sock on cold days but it also allows you to place your toes in normal position instead of clogged. What I love the most about this shoe is the new arch support system, called enhance, that actually builds support right into the structure of the shoe which helps to keep your feet relaxed while the VTR rand places, even more, thicker rubber at the toe to make the shoe more durable. The Evolv Spark was built on a newly designed last, made out of the high-quality leather (upper) with the unlined front and high-friction Trax rubber outsole. All of that provides the perfect balance of comfort, support, and durability which are the most important things for your climbing. 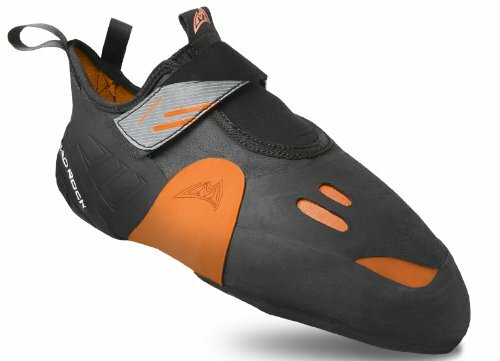 This attractive looking shoe is one of the best high-performance climbing shoes on the market right now. 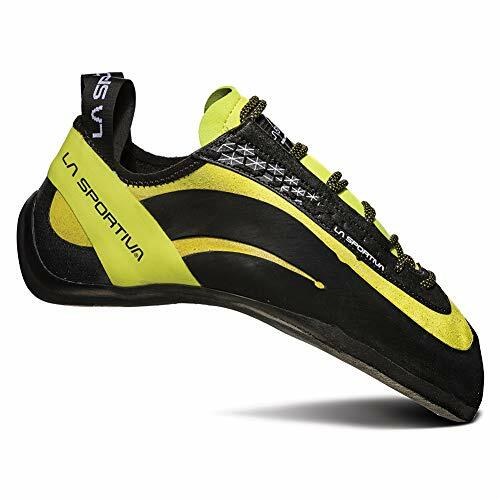 What makes it great is the perfect combination of high-quality craftsmanship and an original La Sportiva’s new technology. Great balance between the comfort, fit and support makes this shoe perfect for steep terrains. What completely amazes me is that it is adaptable for different types of rocks, even for those smeary surfaces like granite and sandstone. Everything about this shoe is on point, including the materials and construction, but what really astonishes me is the sole. All of the magic of the Genius lies in the Permanent Power Platform technology of the midsole and 3mm XS Grip 2 sole with no edge technology of the underfoot. The midsole is really flexible and adaptable to all kinds of surfaces and top outs, but without losing the aggressive shape. Now, let me explain the No Edge technology. With any other shoe, you have to use the specific edges of the shoes on the specific edges of the rocks you are climbing which demands a lot of precision for each step you make. The No Edge technology actually rounds out the edges of your shoes so that you can be less precise on the edges, but more precise on rounded footholds. Another great quality of this shoe is the comfort. It fits like a sock! It stretches just enough, contours your foot and allows you to adjust the tightness. Here we have another high-performance aggressive climbing shoe designed for those who want to push their limits. One thing that everyone, who has ever tried these shoes, agrees on is an amazing comfort. Acro is the shoe that you can wear right out of the box. It is great how stiff and aggressive they are, but at the same time, sensitive enough to feel all the small bumps that you can stick to, which makes the edging great. Rigid full-length 3D ABS mid sole, high tension heel and very soft leather upper, all three combined together in one shoe give you footwear that can handle any rock without beating out your feet. One of my favorite things, though, is that Butora doesn’t have specific men’s and women’s shoes. You can only choose between narrow and wide fit and orange and blue which are the only two available colors. This is really great because it often happens for women to like men’s shoes better, which isn’t as big problem as it is when some women’s shoes are a better fit for men, but they only come in pink (or some feminine print). Incredibly sensitive and hyper precise, Five Ten Anasazi is designed for granite, gneiss, gritstone, and sandstone climbing. It offers a comfortable platform which also makes it a great beginner shoe. The Anasazi provides an amazing comfort and softness which makes it a great choice for all-day climbing but it lacks precision and accuracy that some other shoes in this range have. However, 5.10 redeems for this deficiency with an amazing, very sticky ONYXX rubber that allows you to feel almost every bump on the rock that you can stick to, without losing its shape. The break in period is extremely short and it doesn’t cause your feet a lot of suffering. They might be a little too tight and stiff out of the box, but they adjust to your feet quite quickly. When it comes to size, just one size down from your normal, street shoes size, will be good for the perfect performance. 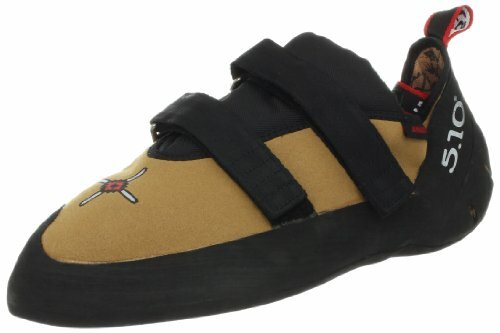 These shoes are capable of climbing anywhere which makes them great all-around climbing shoes. However, if you are looking for an amazing edge performance, I would recommend to keep looking. This aggressive, asymmetric, powerful shoe is perfectly designed for steep boulders and sports climbs. I love the stiff, down-turned sole that makes these shoes edging monsters. The extremely aggressive sole curl your fingers down into to ballet point form of feet which makes it really hard and painful to walk, but then you don’t buy these shoes for walking, you buy them for climbing on madly steep rocks and tops. The shoes fit perfectly on narrow feet. Even the heel, that usually makes the biggest problem for the fit, is here perfect. There is a little extra space in the toes area, but that doesn’t cause any problem while climbing. However, if your feet are a little wider Scarpa Men’s Instinct might be a little tight for you. Any aggressive shoe, especially as aggressive as this one, takes a lot of time to break-in. Combination of the huge amount of Vibram XS Edge rubber and a synthetic upper doesn’t allow this shoe to stretch much and that is why it takes up to three weeks of successive use before they start to feel a little bit more comfortable. The rubber used for these shoes (even on the toes) is excellent and can be found on many high-performance climbing shoes. It is a perfect combination of softness and durability which provides great smearing performance. These pretty much whole rubber slippers with a Velcro strap are designed for roof climbing. A little ‘Marmite’ feature which is actually an extra molded strip all the way through the center of the heel, allows the climber to hook the heel on some small holds which can actually make you feel really safe. I also never had the feeling that these shoes might come off while climbing, under any circumstances, even though they have only one Velcro strap. The Science Friction rubber (awesome name by the way) is the best performing sole I’ve ever tested and it is probably the best one on the market. After wearing them for a while the first layer wears off and that’s when the sole becomes incredibly sticky, which will make you feel secure and confident. When it comes to comfort, these are really soft for an aggressive shoe. The bright orange “Arch Flex” makes this shoe very flexible which adds a lot to the comfort. Mad Rock Shark 2.0 are just perfectly tight and feel snug and secure. Of course, all of that makes it a little hard to put them on but once you do, you’ll see that they fit like a glove. When deciding on the climbing shoes there are some important questions you need to ask yourself before making a purchase. In the further text, we offer you all the information that could be useful for you to narrow the list of shoes you are choosing from. The best way to narrow down your choices is to answer this question. The type of climbing you do the most is the type of climbing you should get the shoes for (obviously). There are many climbing styles that require different sets of equipment and different shoe properties. However, if you are a new climber and this is your first pair of climbing shoes I would recommend to go for an all-around shoe so that you can explore more types of climbing before deciding what your favorite is. But don’t buy just any pair, look for those that are tight enough but still quite comfortable so that you can wear them for a few hours without harming your feet. Unlined leather: The shoes with the unlined leather upper usually have a short break in time and as you break them in, they contour your foot and conform to its shape. These are also the most breathable shoes which make them the least stinky of all. Unlined shoes stretch the most which is a great thing in the beginning, but the more you wear them the more they stretch… so make sure to buy a size or two smaller because if you get the shoe that fits perfectly right out of the box, they will end up being too big just after a couple of wears. The thing you would probably hate at first is that the dyes of the shoes come off and stain your feet for the first couple of wears. You can wash the color easily, of course, but it is annoying anyway. Lined Leather: Shoes with the lined leather upper provide next-to-skin comfort and stretch 1/3 to 1/2 of a size while you are breaking them in so if you are not sure about the size you should get, it is always better to go with a smaller size. These are not as breathable as shoes with unlined leather upper, but definitely are more breathable than synthetic ones which also makes them less stinky. Synthetic: What I like the most about shoes with synthetic uppers is that they are the most durable. They keep their shape and won’t stretch while wearing, so you can buy the size that fits you the most when you try them on in the store. There is no calculating whether you should go a size or two smaller. They are also animal-friendly, which is kind of important to me. However, these are the least breathable which makes them the stinkiest, so make sure to wash them every time after wearing. This is one of the most important factors. There are three different shapes that you can choose from and they are all tied to different types of climbing. Flat shape: Flat shoes are designed for less-steep routes and slabs and they are definitely the most comfortable. One of my favorite characteristics of these shoes is versatility, so if you are looking for an all-around shoe, take look at the flat shaped section. Moderate: Also known as slightly downturned or semi aggressive, moderate shoes are designed for vertical face routes because they allow you to edge better than with any flat shoe. We said that flat shoes are versatile, but definitely not as much as these ones. If you aren’t really sure what type of climbing shoes is the best for you or you want to invest in just one pair of shoes for more types of surfaces, a pair of these might be the right choice. Aggressive: These downturned shoes aren’t really for beginners. These force your foot into an arched position which can really hurt if your feet aren’t strong enough. They are designed for steep sports climbs and boulders where you actually have to hook and stick to a tiny incuts of the walls and that’s where the banana shape helps a lot. However, aggressive shoes are really uncomfortable and you would probably feel the need to take them off every once in a while, and you should. Use every pause to take them off and relax your feet. XS Grip – can be found on most of the Vibram’s high-end climbing shoes. It provides versatile performance and great grip on smooth rocks. Hf – this super sticky rubber is soft enough to conform to any bumps without losing its shape. Mystique – Stealth’s rubber abrasion resistant and really durable. It can last twice as long as other rubbers. Trax XT – high-performing sticky rubber that provides both high friction and an amazing edging on various types of rocks and on many different levels of temperature. Eco-Trax – environmentally friendly rubber that uses recycled rubber and still provides a phenomenal combination of friction and edging. Once you decide on the pair of shoes that are the best fit for you, comes the frustrating part when you have to choose the right size. Always start with your street shoe size, even though they probably won’t fit right but you will get the feeling and it will be a lot easier to determine whether you should go a size or two up or down. Climbing shoes can be lace-ups, Velcro or slippers, but no matter which way you tighten them, they always have to feel snug. The toes of your feet should touch the front of the shoe without being curled unless you are trying the aggressive shoe on. It’s completely ok if the shoes feel a little tight on the sides, they are designed to be tight and snug, but if they are causing you pain you should try on a different size or a different model. What Are the Differences Between the Styles of Climbing Shoes? When deciding on climbing shoe the first thing to define is the type of climbing you are going to do the most. According to that, you can easily narrow down your options. Now there are three styles of climbing shoes, each for the different type of climbing. Those styles are called flat, moderate and aggressive. Now, let’s take a look on each style separately. After my old climbing shoes fell apart I started looking for the new ones. I’m an experienced indoor climber so I knew exactly what I was looking for and as soon as I read a review of the Evolv Spark I knew these were the ones. They fit nicely and I like the colors too but the comfort is the primary reason I bought them. My only advice is to buy a size bigger than your street shoes because those would be too tight in your regular size. Also, don’t wear them barefoot the first couple of times because as your feet sweat, the fabric color might come off on your feet. Otherwise, everything is just perfect and I recommend them. 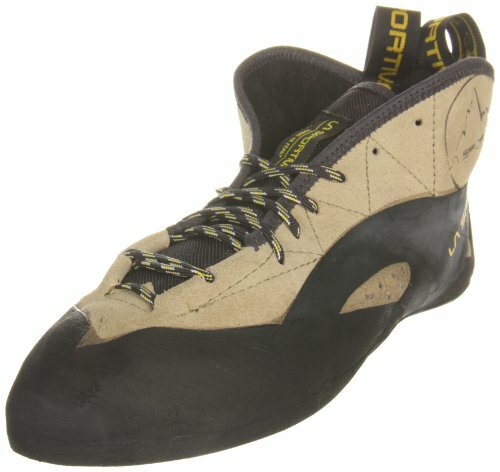 After almost 6 years of twice a week using my old pair of La Sportiva Mythos started to fall apart and I had to buy a new pair of climbing shoes. I haven’t even thought about any other pair, I knew how perfectly they fit and how comfortable Mythos are, so I ordered a new pair of exactly the same climbing shoes. It is a perfect all around shoe and once you break them in they feel like the second pair of your feet. Now, it was ok for me to buy them online because I already knew everything about them from a personal experience, but if you decide on these don’t even think about buying them before trying them on in the store. The size of climbing shoes is very individual. For instance, I always buy a size smaller than my regular street shoes, but my friend that I go climbing with takes the same size. It is all matter of comfort. All the shoes we reviewed today are high-performance shoes with great reviews from both professional and amateur climbers. We have covered all shapes, purposes and surfaces in our list so I’m sure you will be able to find at least one pair that meets all your needs. I hope this article helped you with finding the right model of climbing shoes that will suit your adventure! I am an author at Best Products Pro with a big passion for traveling, photography and everything Game of Thrones related. I enjoy writing about tech and home improvement products. When I'm not writing, I'm reading or spending time with my friends.